When it comes to consummate timepieces for women, prestigious watchmakers Bedat & Co. and Michele easily come to mind since both brands produce timepieces expressly for women. Although other popular watchmakers Michael Kors, Omega, Rolex, Movado and TechnoMarine sell some of the most popular women’s watches in the world, their timepiece collections are not exclusively made for women. Founded in 1995, by watchmaker Jack Barough in Miami, FL, Michele watches started producing high-end quality wristwatches for young children. Five years later in 2000, Barough’s daughter Michele, who the brand is named after, came on board as the brand’s Creative Director. The Baroughs expanded the brand’s assortment in 2000 to include upscale fashion watches for women, featuring Swiss-made movements, premium grade materials of stainless steel, exotic skin leathers and diamonds. Interestingly both the straps and bracelets on many of the watches were interchangeable, allowing for many fashion options. The results lead to the brand’s immediate popularity and global success. Sixteen years later Michele Baroughs remains at the helm as Creative Director and Michele Watches is one of the most sought-after women’s watch brands in the world. 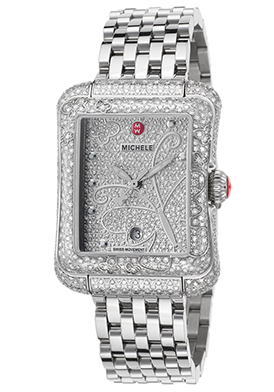 You’ll find an impressive array of Michele women’s watches at luxury retailer TheWatchery.com, including breath-taking styles from the LTD CSX-33, LTD CSX-36 and LTD-Extreme Butterfly collections. Beset with brilliance and luster, both the Michele Limited Edition CSX-33 and CSX-36 timepieces feature round contoured cases in lustrous stainless steel, highly polished multi-link bracelets in stainless steel with shimmering inlaid diamond accents and dazzling diamond inlaid bezels. 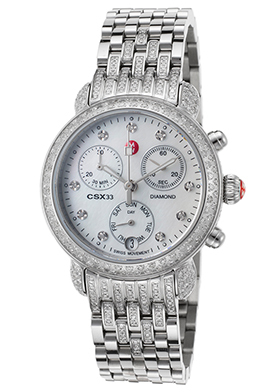 The larger CSX-36 chronograph has a shimmering pave-set diamond dial with three subdials and skeleton hands, while the CSX-33 chronograph has an iridescent white Mother-of-Pearl dial with three subdials, skeleton hands and nine diamond hour markers. The Michele Limited Edition Extreme Butterfly timepiece is pure enchantment. A total of 728 sparkling pave-set diamonds dramatically adorn the contoured rectangular shaped case, bezel, dial, lugs and case sides. The highly polished multi-link bracelet adds to the stylish design. 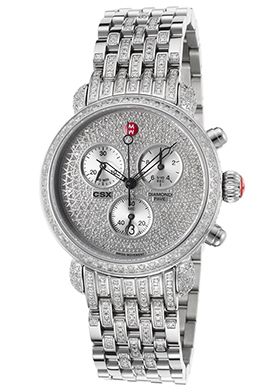 The pave-set diamond dial glistens with a raised butterfly emblem, luminous skeleton hands and hour markers. Each of these three Michele watches features premium Swiss-made quartz movement inside an a scratch-resistant sapphire crystal above the dial along with water-resistance to 50 meters or 165 feet.